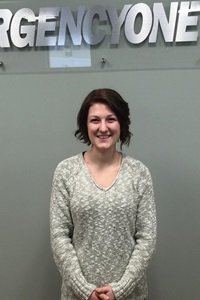 Zoe is the Team Leader of our Front Desk/Receptionist team in New Windsor. She started with Emergency One in 2015 and has quickly shown the work ethic and attitude to grow with Emergency One. Zoe is responsible for all aspects of patient intake including greeting the patient, entering the patient into the EMR system, insurance verification and readying the chart for the patient to be seen by our nurses and providers. In addition, her role includes answering the phones, scheduling occupational health appointments and many other aspects of customer service. Zoe’s is a long-time resident of Cornwall making her a great fit for our New Windsor urgent care office. She enjoys reading, painting, staying healthy and enjoys spending time with her family and two dogs when not at Emergency One.